Nettie Hennekey married John Houghton, son of Roland Houghton Jr and Mary Jane Conner, in circa 1895 age 24 and 23; mar 16 y in 1910 census. Ada Le Roux married Harold Sweet Houghton, son of Charles Buckley Houghton and Emma A. Sweet, in circa 1915 age 30 and 20. Teresa E. (?) married Henry Houghton, son of Thomas Houghton and Elizabeth J. (? ), in circa 1900 age 28 and 25. Katheryn K Houghton married Albert Carter. Katheryn K Houghton married (?) Daugherty. 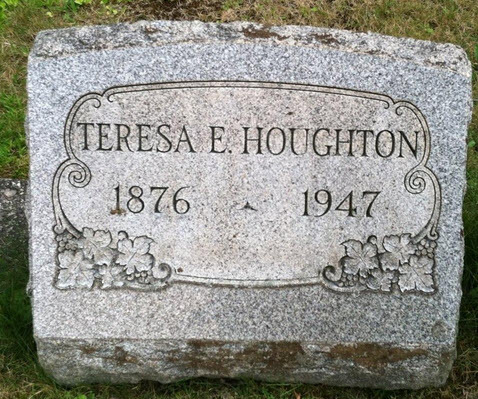 Henry F. Houghton married Margaret (?) in circa 1929 age 40 and 35. Margaret (?) married Henry F. Houghton in circa 1929 age 40 and 35. Rossie M. Willey married Eben Ezra Roberts in Oct 22, 1892 at Meredith, NH, USA. Eben Ezra Roberts married Rossie M. Willey, daughter of Ephraim R. Willey and Susan S. Clifford, in Oct 22, 1892 at Meredith, NH, USA. Margaret Willey Roberts married Howard Stebbins Drew in Jun 30, 1917 at Oak Park, IL, USA. Elmer Clifford Roberts married Frances Helena Hunter in Jan 1, 1941 at Cloveneden, Medford Co., OR, USA. Frances Helena Hunter married Elmer Clifford Roberts, son of Eben Ezra Roberts and Rossie M. Willey, in Jan 1, 1941 at Cloveneden, Medford Co., OR, USA. George F. Owen married Addie Luana Willey, daughter of Ephraim R. Willey and Susan S. Clifford, in Jun 25, 1904 at Whitehall, MI, USA. Charles Francis Owen married Mary Farrington in Jan 18, 1936 at Oak Park, IL, USA. Eben Willey Owen married Sally Reed. Sally Reed married Eben Willey Owen, son of George F. Owen and Addie Luana Willey. Anna Louise Gray married Eben Willey Owen, son of George F. Owen and Addie Luana Willey, in Jun 15, 1939 at Oak Park, IL, USA. Howard Stebbins Drew married Margaret Willey Roberts, daughter of Eben Ezra Roberts and Rossie M. Willey, in Jun 30, 1917 at Oak Park, IL, USA. Howard Roberts Drew married Lenora Jane Garrett in Dec 19, 1943 at Rapid City, SD, USA. Lenora Jane Garrett married Howard Roberts Drew, son of Howard Stebbins Drew and Margaret Willey Roberts, in Dec 19, 1943 at Rapid City, SD, USA. Mary Farrington married Charles Francis Owen, son of George F. Owen and Addie Luana Willey, in Jan 18, 1936 at Oak Park, IL, USA. Ruth Ellen Kooyers married Clifford Farrington Owen, son of Charles Francis Owen and Mary Farrington, in Jul 10, 1965 at Holland, MI, USA.